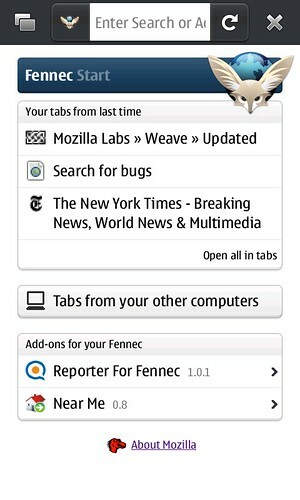 It shows the tabs that you had open the last time you were using the browser, letting you open any or all of them again. 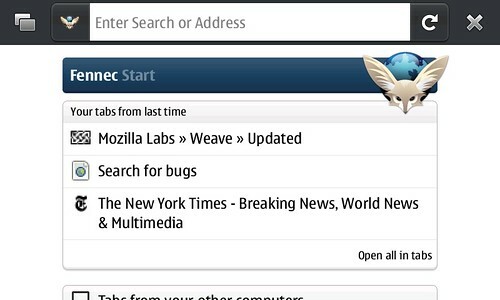 This makes quitting (and restarting) the browser a much less consequence-filled undertaking. It's like a lightweight version of session restore on the desktop. The start page also provides quick access to the tabs you have or just had open on your other computers, like the one on your desk. This is useful when you first open your browser in the case where you leave your desk and now, on the road, need to pick up where you left off. We're also taking advantage of having your attention for a second to show you a maximum of two recommended add-ons that you don't yet have installed. Tapping on one will open the add-ons manager and let you install the one you're interested in right there. 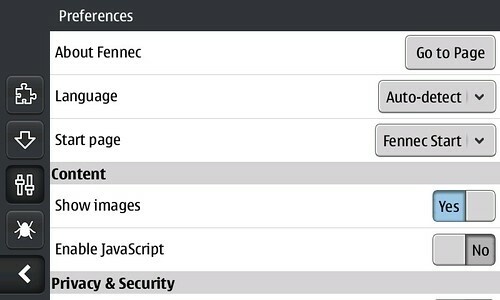 While looking for add-ons is not necessarily a start-up task, add-ons are a huge part of what makes Firefox such a great fit for its users, so interjecting quickly to show people what's new and worthwhile seems like a reasonable thing to do. We're not done, of course. Heading towards version 2.0, I'd like to explore more of how we can use the start page to help people see what's new on the parts of the web they care about since the last time they connected with their online lives. I've written about some of this here before, but it's a topic I'll be writing about more over the next few weeks.